I first met Louise Allan several years ago, when we were introduced via Twitter. I was looking for feedback on my work-- not getting quite what I needed when I asked my family to tell me what they thought of my work in progress. It was Annabel Smith (author of Whisky, Charlie, Foxtrot) who suggested that I invite a couple of other local writers to meet up and talk writing, and one of those writers was Louise. From those early meetings, when we swapped manuscripts and navigated the tricky task of giving each other feedback without damaging any egos too much, to today, when Louise's book is in print and is going incredibly well, she has become a great friend of mine: reliable, honest, compassionate and dedicated to the things that she believes in. I feel incredibly lucky to count her among my friends, and am incredibly proud of how far Louise and her book have come. 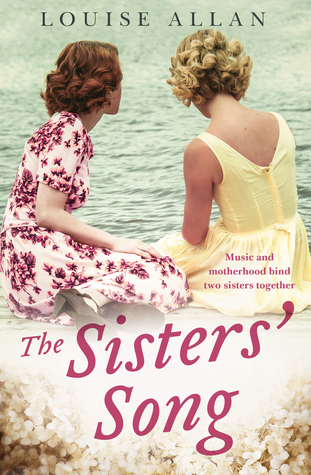 Louise's novel The Sisters' Song was released in Australia on the 2nd of January, 2018. It is the story of two sisters, Ida and Nora, growing up in Tasmania in the early 20th Century. Nora shows an aptitude for music from an early age and dreams of singing on stage one day, just like the great Nellie Melba, while Ida dreams of surrounding herself with a big family. Yet life, it seems, has other plans for these two sisters. The Sisters' Song is a beautiful novel about heartbreak, sisterhood, and womanhood. Of course, it is also a novel about the power music has over us, and there are several stunning passages about the way a person can feel transported by a well-executed performance. It is obvious from reading that Louise Allan is someone who feels music deeply, and knows it well. But the themes which stuck out to me the strongest, and the ones that I could relate to the most were about what it means to be a woman, and about what happens when your dreams remain just out of your reach. Louise Allan explores these masterfully through her two protagonists, and delves deeply into the idea of motherhood and the demands it makes on the individual to give up other things in order to raise a family, particularly at that time, when it was expected by society. The balance between art and motherhood, still a tricky one to achieve today. But it is not a bleak book, for all that it's very realistic. The heartbreak felt by each of her two characters is balanced out by the strength and loyalty that they show towards each other, and the love that they show in holding their family together. This is a book that has to be read to be fully understood. Reviews and blurbs are always fairly reductive, and each reader is going to take away something a bit different from this beautiful, multi-faceted book. There really is a bit of something for everyone. It is a book club read, it is a birthday gift, it is a book to sit in a cosy armchair with, devouring a cup of tea and a chocolate biscuit. I will be treasuring my signed copy of this book and look forward to whatever Louise chooses to write next.